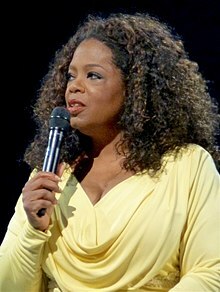 اوپرا ونفري(انگريزي: Oprah Winfrey) جنوري جي 29 تاريخ تي 1954 ۾ مسيسيپي رياست جي شھر ڪاسڪيئاسڪو ۾ پيدا ٿي.پاڻ آمريڪي ميڊيا ۾ پروپرائٽر ۽ ميڊيا ايگزيڪيوٽو ھجڻ کان علاوه اداڪارہ، ٽيليويزن پروڊيوسر ، سماج سيوڪ آھي پر سندس مشھوري ھڪ اسٽيج شو جي ميزبان ھجڻ جي ڪري آھي جنھن جو نالو اوپرا ونفري شو آھي جيڪو ٽاڪ شو ۾ دنيا ۾ سڀ کان وڌيڪَ مقبول ٽاڪ شو آھي ۽ شڪاگو مان 1986 کان 2011 تائين ھليو. ↑ Winfrey has said in interviews that "my name had been chosen from the Bible. My Aunt Ida had chosen the name, but nobody really knew how to spell it, so it went down as "Orpah" on my birth certificate, but people didn't know how to pronounce it, so they put the "P" before the "R" in every place else other than the birth certificate. On the birth certificate it is Orpah, but then it got translated to Oprah, so here we are." "Oprah Winfrey Interview". Academy of Achievement. وقت January 19, 2016 تي اصل کان آرڪائيو ٿيل. حاصل ڪيل August 25, 2008. ↑ "Oprah Winfrey". IMDb. حاصل ڪيل March 28, 2015. ↑ "The World's Most Powerful Celebrities List". Forbes. https://www.forbes.com/wealth/celebrities/list?ascend=true&sort=moneyRank. Retrieved May 21, 2013. ↑ "#184 Oprah Winfrey". Forbes. https://www.forbes.com/profile/oprah-winfrey. Retrieved May 10, 2017. ↑ "Oprah Winfrey in Melbourne for Australian tour 2015 spreads a message of love, reveals lost child". News.com.au. http://www.news.com.au/national/victoria/oprah-winfrey-in-melbourne-for-australian-tour-2015-spreads-a-message-of-love-reveals-lost-child/news-story/88f87e6fe05a940399db9450a876cfab. Retrieved September 25, 2017. هيءُ صفحو آخري ڀيرو 19:52، 23 سيپٽمبر 2018ع تي ترميميو ويو هو.